What do Physicists do after earning a Bachelors Degree? Physicists work in a variety of areas from basic research at universities and government laboratories to education to healthcare to manufacturing to consulting and analysis firms. Because many of the job titles held by Physicists do not include the word physicist, it is often difficult to identify physicists and gather good data on what physicists do and how much they earn. However, the American Institute of Physics surveys physics degree recipients regularly and they have found the following information about the employment trends for Physicists. What do Bachelors recipients do? In recent years, about 40% of all bachelors degree recipients enter the workforce immediately after graduation. About 35% of all bachelor degree recipients pursue graduate degrees in Physics or Astronomy and about one 20% pursue a graduate degree in some other field. Typically, less than than 5% are unemployed. For physicists that immediately pursue careers immediately after completing bachelors degrees, the typical starting salaries have a wide range. They start as low as $40,000 for those employed in non-technical jobs to $65,000/year for those working in private companies that are involved in science and technology endeavors. The low end of this scale is comparable to the typical starting salary of biology and environmental scientists with bachelors degrees. In the middle of this range, physicists earn salaries comparable those of starting chemists, civil engineers and accountants. At the high end of the scale, the salaries are closer to those of electrical engineers, mechanical engineers and computer scientists. While these initial salaries are interesting, some other interesting facts are how career paths evolve over time. Five years after receiving their degrees, many physics bachelors recipients are in jobs with titles that do not include the word Physics. Their jobs involve working as software developers, engineers and science/lab technicians and managers, or even patent lawyers. To learn more about Careers in Patent Law for Physics Majors, check out this article published in AAPT's The Physics Teacher. You can also attend a free webinar offered by APS on Careers in Patent Law. For more details visit the APS webinar homepage. Of the 65% of the physics bachelor recipients that pursue advanced degrees, nearly 15% pursue advanced degrees in engineering fields. The rest pursue degrees in mathematics, medicine, health services, education, law, business and more. The breadth of fields in which physicists are interested and are able to contribute is very large. The undergraduate curriculum for physicists is an excellent preparation for these fields. For example, physicists earn very high scores on the Medical College Admissions Test (MCAT) and the Law School Admission Test (LSAT). 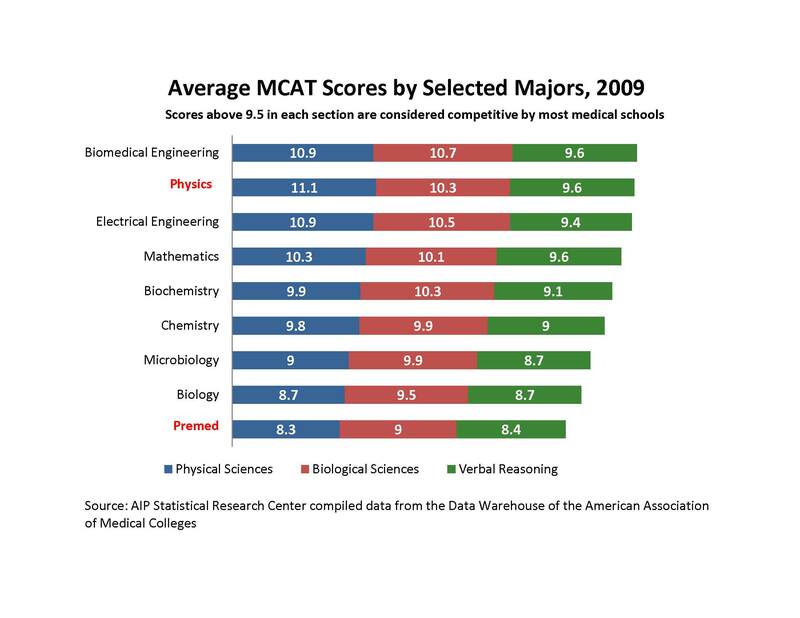 They also account for less than 1% of the individuals that take the exam, which often makes them stand out when compared with other applicants for medical school. The job outlook for all fields is certainly not as positive as it was just a short time ago, however careers for physicists are still holding strong. The job growth for the field is expected to be 7%, according to the Bureau of Labor Statistics. Openings due to retirement or career changes are not included in this number.